When my little sister in law told me she was getting divorced, I hurt for her. She’s fourteen years younger than my husband and me, quite an age difference. The first time I met her, she was probably in Kindergarten or first grade. She crawled up in my lap with a Christmas catalog and showed me toys she hoped Santa would bring her. I was beyond charmed by her. As I said when I toasted her at her wedding, I fell in love with her even before I loved her brother, my husband of now 22 years. “Your news really threw me for a loop. I hope you’re doing OK, and I want to do anything I can to help you, so just let me know. I’ll ramble here for a minute, but stick with me. So, the way I pray is to do something and keep my hands busy, and I pray even better for someone in particular when I’m making something for that person. This is why I really connected with the Japanese idea of folding 1,000 origami cranes for someone who is sick, to show them how much they’re in your thoughts. It’s like visible prayers. I couldn’t sleep last night, kept thinking of you two, how things are changing for you and all the crappy things you’ll have to go through in the time ahead … I have a stack of quilts in my “to do” pile, but I want to skip ahead and work on one for you, because it will help me pray for you and do something for you. I feel like I should be doing something, so it will help me, and you’ll need a fresh start, so something new that’s just yours, maybe that will help you, too. 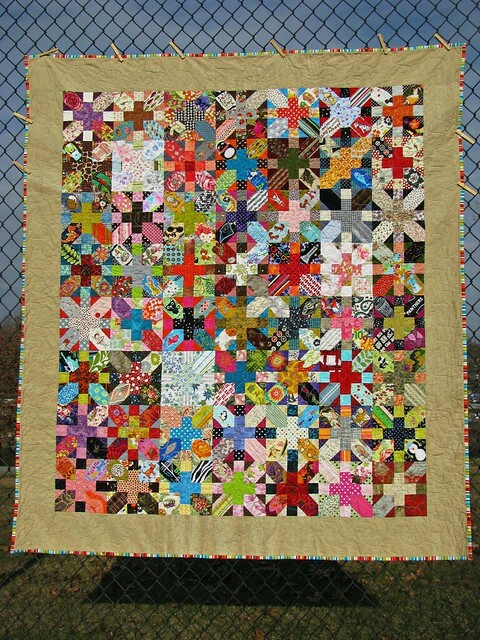 I worked on her quilt while I worked things out in my mind and tried to fill her quilt with a little of everything. There’s a bit of grrrrr in there, but also lots of hope and love. Divorce is never easy. I used many different textures and so many little things that I hope will have meaning for her. Two blocks are made from the quilt fabric for a quilt I’m making for her parents, a nice connection between their quilts. There are some fabrics from things I’ve made for her in the past, fabric I bought in or about places we love, and things that will hopefully just make her smile. There’s even a block about her dog — I know she’ll like that one! 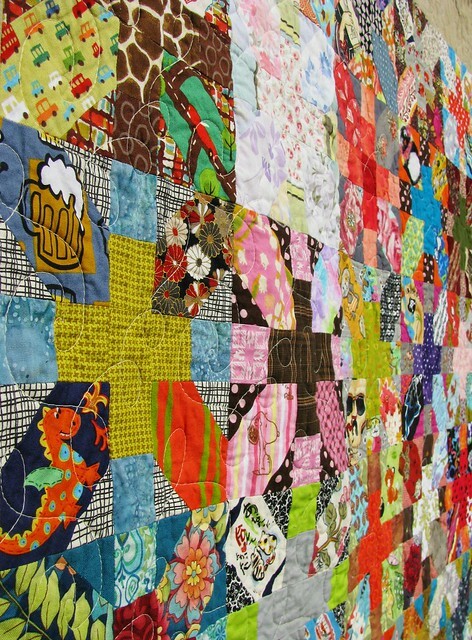 This quilt is a wish for a happy future for her. It might be different than what she had planned, but it can still be wonderful. She’s a tough chickie, I know she’ll be OK.
Aww, thank you! I hope she’ll like it. (She’s seen lots of pictures, to it’s not a surprise.) I get to give it to her soon! I did too! She is very lucky to have you, Sarah. I can’t wait to give it to her, and I hope it’s a comfort to her! It really is bright and happy looking, so that’s got to help a little, right? It can’t hurt! And, when times get tough, she can curl up in it and feel that you are hugging her. 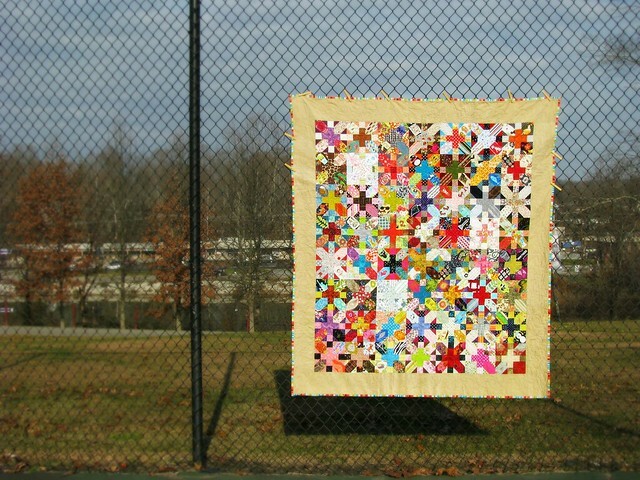 I’ve done that with my graduation quilt that my BFF made me. 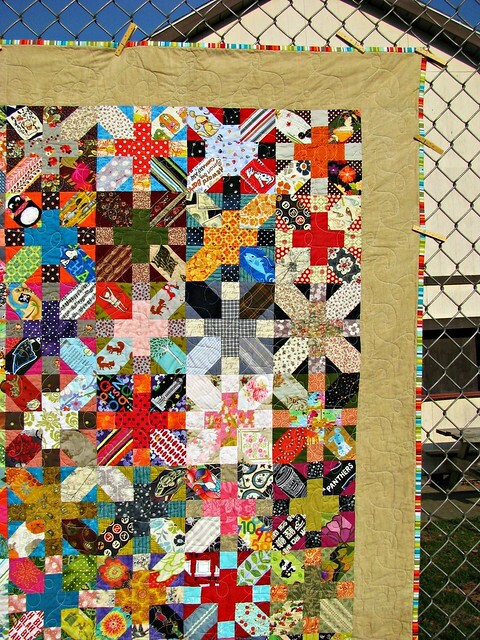 I love this post – I love this quilt and I SO love your ‘praying’ while your hands are busy – I almost feel like we are cosmicly connected. I do this too! Your SIL will love this – I’ve been through a messy divorce (a long time ago now) but still remember the pain – you are both lucky to have each other. I absolutely adore this. You are such a sweet and loving person, and make such wonderful gifts while ‘praying’. 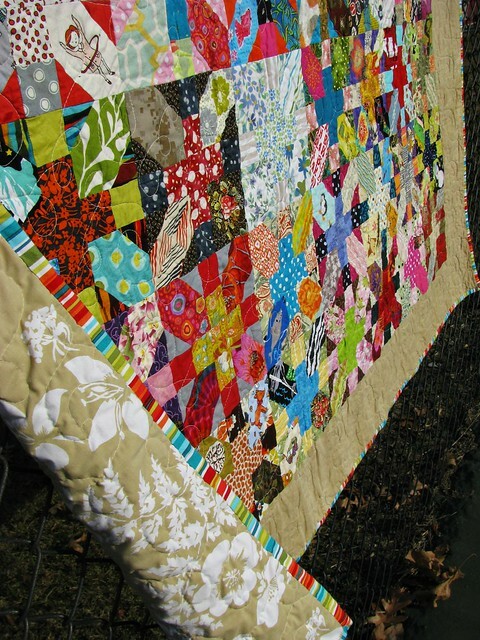 I still need to try to learn to quilt, these are so inspiring. If only I had your patience!